How to dehydrate food through a food dehydrator? Ever Wondered How A Beef Dehydrator Works? Dehydrating foods has fast become a popular way of food preparation over the past 20 to 30 years. People have begun to realize that owning a food dehydrator in their own home could hold a plethora of benefits, from saving them money on dried fruit and jerky bought from the grocery store, to allowing them to make dried fruits to take on camping expeditions for survival. Drying foods also lets you store them safely for months on end, rather than having to consume them quickly before they turn moldy. It also ensures you know exactly what is in your dried snack – rather than having to eat the huge amounts of sugar and salt that are put into ready made products. You must first begin by making sure your food is dehydrating-safe. This involves washing fruit and vegetables (we recommend you rub mushrooms with a dry piece of kitchen paper instead, as they tend to soak up moisture) and cooking meat and eggs to 160 degrees fahrenheit to kill bacteria. Once this has been done you are safe to heat the meat to a lower temperature (usually between 130 and 150 degrees). Next, you will need to slice your fruit, vegetables or meat. NOTE: if you’re making powdered eggs, or fruit leathers, then please see our other guide pages for these (this guide is intended for sliced foods). How thick you choose to slice them is entirely up to you, but we usually choose around 4 to 6mm. Marinade your meat if it’s necessary (small slices like this need just one minute) and place them onto your dehydrator appliance’s trays. If you are using fruit that tends to brown (apples, bananas, melon etc.) then we highly recommend that you soak them in acid solution first. Don’t worry, this is not dangerous! It is simply 1/2 a quart of water, with 2 tbsp lemon or lime juice mixed into it. You can, alternatively, use ascorbic acid but you will need to follow the package instructions carefully, as this solution is stronger than lemon/lime. From there, all that’s required to dehydrate food is to turn the appliance on and wait! How long it will take depends on how thick the slices are, what temperature the dehydrator works at and what you are drying (jerky takes up to four days, fruits and vegetables generally take up to two). Once the dry foods are ready, turn off the dehydrator and remove the slices, but allow them to cool to room temperature before you store them in airtight containers, e.g. tupperware boxes (zip-lock bags also work well). If you’re thinking of ways on how to save money, a food dehydrator is a device that can greatly help you on this concern. This device makes food last for longer period, even longer than your fridge can. Using this will prevent foods from being spoiled easily so you can use them on the days to come. You also don’t have to buy fried fruits or ingredients because you can make food dehydrator recipes at home. How does a food dehydrator do this? This device removes the moist of foods therefore bacteria are less likely to develop as they grow when there’s moist on foods. The growth of bacteria on foods is the reason why they become spoiled. If you still have more foods like meats, vegetables and fruits on your refrigerator and you were informed of a scheduled power outage, you don’t have to worry about having to throw the foods after the power interruption. You can use these in making food dehydrator recipes. Fruits and vegetables that are in season are sold for a cheaper price. Take advantage of the savings that you can get by buying more while they are still being sold at lower prices. Use your food dehydrator to preserve the fruits and vegetables you bought. If you have vegetables and fruits in your garden, you can also dehydrate them for future use. 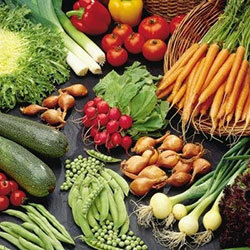 The nutrients that you will get from fresh fruits, meats and vegetables will stay even after dehydrating them. Whatever food dehydrator recipes you decide to make, it’s important to ensure that the foods are sliced thinly with the same proportion so they can dry at the same time. Some of the food dehydrator recipes that you can try are beef jerky, fruit leather, chili peanuts, corn chips and raisins. Food dehydrator recipes are best for snacks and on cooking other menu. Aside from the fact that these foods are delicious, they can also save money because they are made from cheap ingredients, overstock on your fridge or fresh produce on your garden. Storing foods like fruits, meats and vegetable on the fridge can make them last for days. However, using a food dehydrator can make them last even longer. A food dehydrator is a device used to remove moisture on foods, which allow them to last longer. There are several food dehydrator recipes that you can make which can serve as snacks or ingredients to your other recipes. Meats, fruits and vegetables naturally consist of some percentage of liquid. Removing liquid using food dehydrator will also save space because foods decrease in size after the process. If you’re not sure what recipes to make using your dehydrator, you can search for different food dehydrator recipes online. Once decided, you can proceed making your food dehydrator recipes. Here are some of the recipes that you can try. Get a bowl and prepare your marinade by mixing together Worcestershire sauce, spy sauce, salt, pepper, garlic and brown sugar. Sliced beef tenderloin thinly and place on a plate. Get the marinade you prepared and spread it on the sliced beef. Cover this with plastic and refrigerate for at least 8 hours. Get the sliced beef and arrange the slices on the food dehydrator. Make sure that the slices do not overlap with each other. Set the device to 240C and wait for about 4 hours. Set the temperature of the dehydrator to 175C and check every now and then if there’s no more moist left. If so, turn off the device and cool the beef, then store in a container. Blend apples, strawberries and 2 tablespoons of water using food processor. Pour mixture on the dehydrator and dry for about 7 hours or until the mixture turn into a leathery fruit roll. Remove this from the device and store in a container. There are more food dehydrator recipes that you can try. Kids will surely love these for snacks. Many people buy dehydrators with the sole intention of drying fruit, as it’s very expensive to buy ready-dried from grocery stores, and drying is a great way of ensuring your fresh fruit doesn’t spoil. But what about dehydrated vegetables? It’s certainly possible to dehydrate vegetables just as it is with fruit and meat, and there are a huge number of uses for them too. Dried beans, peas and pulses can be used for cooking (in stews and soups) and they’re also one of the easiest vegetables to dry. Other possibilities include tomatoes to be put on pizzas and in salads (but bear in mind that these are best when they’re peeled, as the skin goes tough once dehydrated) and mushrooms for pasta and pizzas too (do not wash mushrooms before you dehydrate, but instead rub the dirt or outer layer off with kitchen paper). If you’ve never tried vegetable chips before then you’re in for a treat with a vegetable dehydrator. You can dry thin slices of beets, zucchini, parsnip, swede and carrot to make naturally sweet and crispy chips. Another great idea is to dry chili peppers that you’ve grown on a plant, and then grind them up to make chili flakes. You can then use it as a dressing (from a shaker) or sprinkled in sauces as they cook. Before you can make these kinds of foods, you need to learn how to dehydrate vegetables. The principles are the same as with fruit: wash or rub clean with kitchen paper, remove the core if necessary (as with corn on the cob) or the skin (as with tomatoes and bell peppers), slice thinly and place in your dehydrator. Ensure that you remove any seeds, and if you are dehydrating mushrooms then these should be dried at a lower temperature and for less time. There’s no reason why you can’t dehydrate any kind of vegetable, and it’s well worth trying each one out to see which ones you like the best. A vegetable dehydrator is also a very useful appliance for those who grow their own vegetables, and sometimes have too many to eat before they go moldy. Store all of your dehydrated vegetables in zip-lock bags or tupperware boxes in a cool, dry place and they’ll keep for many months. Beans, green:Stem and break beans into 1-inch pieces.Blanch. Dry 6-12 hours until brittle. Corn:Cut corn off cob after blanching and dry 6-12 hours until brittle. Own the best and most effective food dehydrator. You may check it online and read lots of reviews. Make sure that before you will use the dehydrator, you have read the manual. This is very important so that you will use the dehydrator properly and the results are perfect. Choose the freshest fruits and vegetables. Slice them evenly to get accurate results. You can add salt, sugar, or other spices to add flavour. 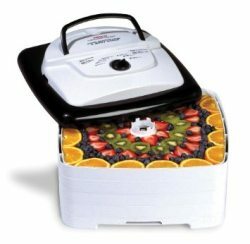 Put the sliced fruits and vegetables inside the dehydrator. Make sure that you will properly arrange them. Turn on the dehydrator. Take a look at the manual to determine the recommended drying time. Some dehydrators take hours to dehydrate food while there are others which may take days to dehydrate. Monitor the foods being dried. Some dehydrators need to be rotated while others don’t. Make sure that they are all equally dried. To check if they are dried properly, you may cut a slice. If there are no moisture beads, it means that the process is complete. Drying food is one of easiest, best, and oldest ways of preserving food. Unlike other methods of food preservation, food drying is not an exact science. There are many methods; some are more traditional using dry air and the sun, and others that use modern day technology such as food dehydrators or ovens. The more traditional methods do have many benefits but are often not feasible considering the climates we live in. To understand the best method of dehydration, it is important to understand how drying food works. Drying food, simply stated, is taking the moisture out of the food so that bacteria cannot grow and harmful enzymes cannot react to spoil food. The process is typically done by passing hot dry air around the food. This causes the moisture to evaporate from the food leaving a leathery feeling to the food when the moisture is gone. Since we are removing the moisture from the food, at first the air can be hot and not cook the food, however as the moisture is removed it is important to remember that the temperature may need to be adjusted. To ensure proper dehydrating please follow the following simple guidelines. – Make sure that you have the proper equipment necessary. This includes clean trays for good air flow, the right size of dehydrator for the amount of food to be dehydrated. – Make sure that the food is properly prepared. Cut to the right sizes, peeled when necessary, and ALWAYS fresh. – Ample time to dehydrate the food. Food dehydration must not be interrupted. If it is interrupted it gives the opportunity for bacteria to grow. Bacteria will grow quickly because of the warm moisture left in the food. – The temperature is very important to food drying. The temperature can be at a higher range (150 – 160 degrees) during the beginning of food dehydration. The temperature can remain high because the moisture keeps the food temperature lower. As the moisture evaporates from the surface of the food the food temperature can rise, so it is important to monitor the temperature so that you do not “cook” the outside trapping moisture inside. – As the surface of the food dries, turn the temperature down, as the drying process slows to pull out the moisture from the inside of the food. – The higher the temperature and the lower the humidity in the air will speed up the drying process. Humid air slows down evaporation, it also contributes to “case hardening” or cooking the outside of the food before the moisture can be released. – Make sure that there is pleanty of room for air flow around the dehydrator. Dehydrated eggs are a foodstuff used in cooking and baking. They are exactly what their name suggests, and they’re essentially eggs that have had all of the moisture drawn out of them. Dehydrated eggs can be stored for many years (when sealed in the right packaging) without going moldy or going stale. They act in just the same way as normal eggs do when they’re mixed with other ingredients, and many people use them to make omelets, quiches, cakes and scrambled egg dishes. For those that keep chickens, you may have experienced periods of extreme productivity, when you’re overrun with hens laying constantly, and end up trying to give eggs away to other people. With a food dehydrator you can store those eggs away in their dried form, to be used at a later date instead. Also, you may find powdered eggs much easier to use in cooking than fresh ones – after all, they can be messy. For these reasons and many more, we’re going to show you how to dehydrate eggs. Firstly, break the eggs into a bowl and whisk until they’re well beaten. You can separate the whites from the yolks and just dry the whites if you want a low fat option. You then need to ensure that any bacteria is killed off, so fry in a non-stick frying pan (without any oil or butter) for a short time and on a medium to high heat. We find that dehydrating eggs is easier when you scramble this mixture (but don’t add milk!). Simply pour the mixture onto your dehydrator’s fruit leather tray and turn the appliance on. If you are able to set the temperature, choose anywhere between 140 and 150 degrees fahrenheit. You should dehydrate eggs until the mixture has gone hard, and then break it up or put it in a blender to make powder. The final step in dehydrating eggs is choosing how and where to store them. They need to be in airtight containers, so tupperware boxes with clip down lids are good, zip-lock bags will also work, and glass jars with seals around this lids are also great. So there you have it, your guide to dehydrating eggs! As you may have seen throughout our website, there are many uses for a food dehydrator, and drying eggs is amongst one of the best. Please make sure to soak and wash your fruit leather tray well before using it again for a different purpose. Deer Jerky, or Venison jerky as it is also known, is something of a delicacy in the US. It’s an affordable one, but many people see this food as a treat, as it is often so expensive to buy in stores. If you are a hunter, however, or you know of somewhere that you can buy deer shoulders for a reasonable price, then you can make your own deer jerky for a much lower price. What’s more, you can also choose your own seasonings and marinades, so your deer jerky recipe is well and truly a personalized one. – 1 jerky gun: you can either choose to use a jerky gun, or use a fruit roll-up sheet and cut jerky strips from this. 1. Put the ground deer into your mixing bowl and add all of the other ingredients. Mix by hand, thoroughly. It doesn’t matter if you squeeze the deer jerky as it is going to be compacted into jerky strips anyway. The more you mix it together, the better it will taste. 2. Cover the bowl containing the mixture and chill in the refrigerator overnight. This allows the flavors and seasonings to ‘take’ to the meat. 3. The next day, remove the meat and fry (without oil or butter) in a non-stick pan until piping hot throughout (this process kills all bacteria that may be on the meat). 4. Either spoon the mixture onto a fruit roll sheet and press down so that it’s smooth and covers the entire surface area, or fill your jerky gun and use it to squeeze jerky strip shapes onto a normal dehydrator tray. 5. Turn on your jerky dehydrator on a medium to low setting (if the thermostat is adjustable) and simply dry for up to 4 days. You can check the jerky whenever you like to see when it’s ready. 6. When the jerky is completely dry and feels leathery, turn off the dehydrator, cool to room temperature and store (in air tight containers or zip-lock bags). – 1 food dehydrator: while you can buy specifically manufactured jerky dehydrators, any model of dehydrator is more than capable of making deer (and any other meat) jerky. 1. Using your chopping board and knife, cut the meat from the skin and fat, discarding the skin and fat. 2. Cut the deer meat into strips between 1/4 and 1/2 an inch thick, 1 inch wide and around 5 to 7 inches in length. 3. Mix your other ingredients together in your mixing bowl, and place each slice of deer meat into it, so that each side is covered. 4. Cover the bowl with plastic wrap and refrigerate the deer strips in the marinade mix overnight. 5. The next day, take the meat strips and place them onto your dehydrator trays. Turn the appliance on and simply wait for it to dry over the next 2 to 3 days. Remove when leathery and dry, leave to cool to room temperature and store in airtight containers. Making beef jerky at home has a huge number of merits, not least because it cuts the large costs of buying it ready made and ready packaged from the grocery store. What we love most about homemade beef jerky made in a dehydrator is that you have complete control over how it turns out. Once you learn how to make beef jerky at home the choice is yours. Choose which jerk seasoning you use, what marinade, even what meat and whether that meat is sliced or ground. You can tailor your jerky to exactly how you and your family enjoy it the most. To make beef jerky at home, you must first marinade and season your beef. Slices of no thicker than 5 mm need just one minute of marinading before they’ve soaked enough up for flavor. Many people then put their slices straight into the dehydrator, but this runs the risk of breeding harmful bacteria within the meat. It’s best to cook this off for a couple of minutes at 160 degrees fahrenheit (or shallow fry in oil until the meat is piping hot throughout). If you’re using ground beef then this can also be fried, and you can add the seasoning and sauce whilst cooking. Next, simply place your beef slices onto your dehydrator tray, turn the device on and leave it to dry for about 3 days on a relatively low setting. That’s it! Now you know how to make beef jerky at home. Manufacturers such as NESCO produce accessories to help out with making beef jerky at home, such as the ‘Jerky Gun’. To use this product you fill it with ground beef, mixed with the spices and jerk seasoning of your choice. Simply squeeze the jerky mixture from the end and straight onto your dehydrator for drying. This is a great option if you like making beef jerky from your leftover cuts of meat, or you often find ground beef on sale in your supermarket and would like to make use of it. Making beef jerky at home is a very simple process, and while you will have to wait three days for the result, the preparation takes no longer than 10 minutes. As a way to save money and create your own delicious beef jerky, we highly recommend it. There is nothing wrong with slicing beef and putting the slices straight into your dehydrator appliance to be dried without a marinade, but to eat them as a snack is often unsatisfying. Our beef jerky recipe is a simple one, using ingredients found in most people’s kitchens, and while we suggest you let the meat marinade overnight, this is not absolutely necessary and you can leave it for just 5 minutes. As a result, this jerky recipe is incredibly quick and easy to make, with very enjoyable, authentic tasting results. 1. Using the knife and chopping board, cut your beef into slices around 1/4 inch thick, 6 inches long and 1 inch wide. 2. Mix all of your other ingredients in the mixing bowl, and then place the beef strips into the mixture so they soak it up. Cover the bowl with plastic wrap and refrigerate overnight. 3. The next morning, fry your beef slices (without oil or butter) in a non-stick pan until they are piping hot throughout. This kills off any potential bacteria that could grow in the low temperature of the dehydrator. 4. Place each slice of marinated beef onto your dehydrator trays (not overlapping) and switch it on, on a low heat (between 130 and 150 degrees) for up to 3 days. Turn it off when the beef is dry and feels leathery. 5. Remove the strips from the dehydrator and leave to cool to room temperature before storing in airtight containers or zip lock bags. As far as recipes for beef jerky go, this is one of our favorites and we love it for its simplicity. Chances are you already own all these ingredients, and they’re readily available in grocery stores. What’s more, you can always personalize the recipe to make it your own and suit your own tastes. Add chili powder or flakes for a spicy marinade, or 1 tsp molasses for a sweeter taste. Beef jerky makes a great appetizer, served plainly in a bowl before a main course, or as a snack. You could even wrap some up and put it in your child’s lunch box for a protein-packed savory snack at school. However you serve it, we hope that you enjoy our beef jerky recipe. Thousands of people across the US have a fig tree or two in their garden. Those people will know all too well that sometimes a harvest will be particularly ‘fruitful’, and then you find yourself overrun with figs and no idea how to use them. Food dehydrators are incredibly useful in this way, because they dry fruits, vegetables and meat out so that they no longer go moldy, and if you store them in an air tight container then they can keep for many months. Dried figs, in particular, will keep for up to 24 months if you dry them in the right way, and that’s just one of the many benefits of drying figs. In this guide we’re going to teach you how to dry figs at home. You need to begin dehydrating figs by first washing them. It seems counteractive to cover them with water, but this is an essential part of the process! Dry them, and cut off any hard stalks. Secondly, slice your pre-dried figs at 1/4 of an inch in thickness. Next, they need to be soaked in an acidic solution for around 10 minutes. This should be made up of 1/2 a quart of cool water, with 2 tsp of lemon/lime juice. Remove the fig slices (without drying) and place them onto your food dehydrator tray. 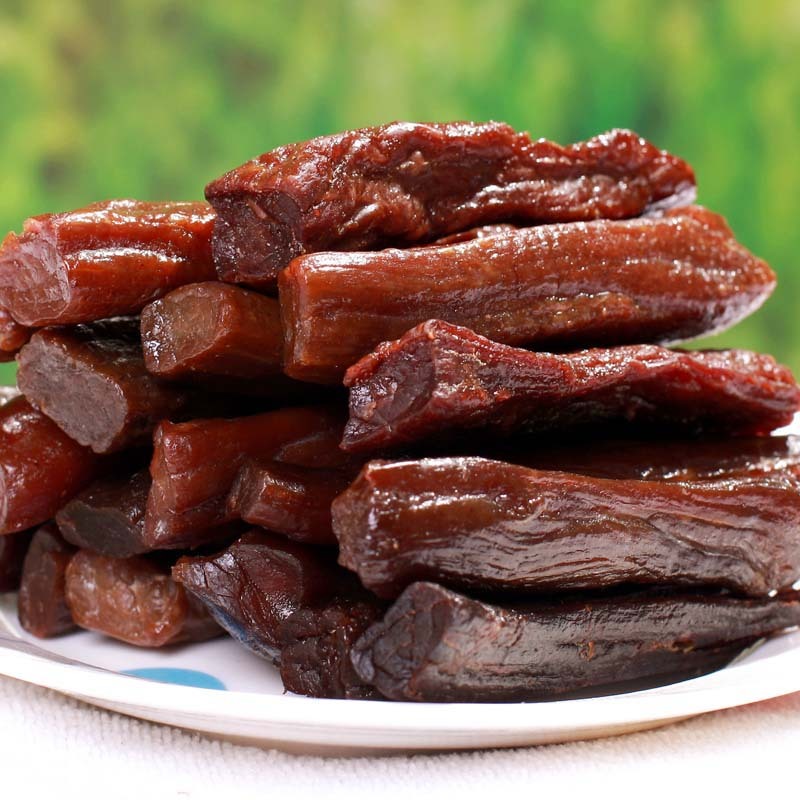 Turn the appliance on and leave it to run for 12 hours to a whole day – drying fresh figs doesn’t take as long as jerky for example, but they do need longer than overnight. You should only remove the figs when they feel like they have no moisture left in them, and when they feel leathery. Put them on a plate to return to normal room temperature, and then place into a clean, airtight container or glass jar with a seal around the lid. Your dry figs can then be stored in a cool, dry cupboard or in the refrigerator, but should be kept out of sunlight. You can also dehydrate figs in a different way, and that is to make them into fruit leathers. These are dried rolls of fruit puree, which come out with a texture and taste great, but are in fact very healthy. Wash your figs and turn them into puree with a hand blender or in a kitchen top blender (try not to add too much water), add a little sweetener if desired (sugar, honey, molasses) and a tsp or two of lemon or lime juice. Pour onto the fruit leather/fruit roll tray of an electric dehydrator. After around 8 to 12 hours you should have a fruit leather, that you can roll up and eat, put in your child’s lunch box, or store in a zip lock bag for later enjoyment. Drying figs has a number of benefits, not least to provide a healthy and very tasty snack. You can eat dried figs with your muesli, put them in a family member’s lunch box, or even put them in cakes. Figs dried in a dehydrator are also much more healthy than they are when bought from a grocery store, as you know exactly what has gone into them, and none of the ingredients are unhealthy. Have you ever tried venison jerky? Man learned how to dry meats millions of years ago. Deer and other animals were very plentiful during the warm months, but as the snows of winter set in, hunting was very scarce. If it had not been for the mountain deer, and the Elk that roamed the forests and ridges; man may have been among the extinct species that roamed the earth. Over time man discovered how to dry the venison, and make venison jerky, during the warm months and save it for the winter time. As time went on, man discovered that they could dry the entire tribes’ meat by hanging the meat and the venison jerky in a shelter and building a fire under the meat. This was what is now called dehydration; the process of drying the water completely out of venison jerky. This process lasted up until approximately 50 to 75 years ago, when people began dehydrating their meat in an oven. Today food dehydrators have become very popular for the hunters who get enjoyment from knowing how to dehydrate their freshly killed deer. Professional dehydrators have learned many different ways to make their venison jerky. They first learned how to use salt to help preserve the meat even longer. Now there are venison recipes that not only use Hickory Smoke, but also use Teriyaki, Hot & Spicy, and many other ingredients. The very first thing to do when you are dressing out your deer, is to save one of the flanks for preparing Venison jerky. Once this is done, you can cut the flank steaks diagonally with the grain of the meat. Make sure that these slices are very thin. A quick tip: place the flank in the freezer just long enough to be slightly frozen. This makes slicing the meat much easier. Once the meat has been cut into thin slices, it should be approximately 2 pounds. You will need to make a marinade using 2/3 cup of soy sauce, 2/3 cup of Worcestershire sauce, 1 teaspoon of garlic powder, 1 teaspoon of onion powder, and 2 teaspoons of seasoning salt. Mix this together for the marinade. Now place the thin venison jerky strips in the bowl of marinade that you just made, and let it marinate for 24 hours in the refrigerator. Then you can take the strips out of the bowl one at a time, and using paper towels, dab the excess marinade off the strips of meat and place the strips in your beef jerky dehydrator. If you are new at using a dehydrator you can simply read the instructions to set the dehydration time for the meat. This will usually last for months, however more than likely it will be consumed in just a few days. Beef Jerky maker is an appliance that uses warm air to dry out the juices of the beef and turns it in to beef jerky. These are a great thing to have; you can dry all your meats out for jerky. There are many flavors you can make such as, “bar-be cue”, “hot and spicy, “teriyaki”, hickory smoked and many other flavors to make. You can make jerky out of any meat that you desire however the most common meat used is beef. They have many beef jerky makers on the market that comes in many shapes, size, and forms, depending on what you are looking for. When you are looking to purchase a beef jerky maker you should always look at the size of it make sure it has plenty of room for the air to flow through. Another thing you should look at when you want to purchase one is the size of the fan that is circulating the air through the tunnels inside the maker; the fan is what helps dry out the desired meat. A beef jerky maker is very affordable and a good appliance to have as well. What a beef jerky maker does is that it dehydrates the beef to a very tasty household snack for the whole family. When you use a beef jerky maker what it is doing is drying out all the blood and juices from the meat allowing it to be a dried out tender peace of meat. There is many beef jerky makers offer such as 9, tray, 5 trays, 4 trays, depending on what sizes you would prefer. The nine trays offer a 7”fan at 600 watts 9 trays with 15 square feet of drying area, 9 polyscreen tray liners, and it has adjustable temp. From 85f-145 f this item is called the Excalibur series. The 5 tray Excalibur is a great choice for a medium size kitchen it offers a 5”/400watts, 5 trays with 8 square feet of drying area, 5 polyscreen tray liners and it has an adjustable temp from 85f-145f. Its is a great appliance to have in your home, if you like beef jerky then you will need to purchase this beef jerky maker. The 4 tray Excalibur is great little appliance to have in your kitchen it offer a 4”fan/220 watts, 4 trays with 4 square feet of drying area, 4 polyscreen tray liners, and adjustable temp from 85f-145f. Its small but it works just as well as the bigger models you will be happy with any of these beef jerky makers. When you purchase one of these beef jerky maker models, you and your family will enjoy making your own beef jerky. Fruits and vegetables are important to keep everyone of us healthy. However, there are people especially the kids who are not attracted to eat vegetables. Dehydrating these vegetables is a great way to encourage kids to eat healthy foods. One of these is the potatoes. Wash the potatoes. It is not necessary to choose the freshest since you can also choose the frozen once. Peel them and put them into a bowl of water so that their color will not change. Slice them accordingly. Put them into a food dehydrator. Make sure that you will arrange them in single layer and with appropriate space between them. In this way, all of them will dry evenly. Always follow the manufacturer manual on how to use the dehydrator. Some of them need to be rotated while others are not. In the end, just make sure that there is no presence of moisture in those potatoes. Lastly, these can be great during breakfast. On the other hand, when you and the whole family go to camping or picnic, you can bring and eat those dried potatoes. You just need to be a little creative and imaginative so that you can prepare great recipes with your dehydrator. Dehydrating meat is one of best ways to let your family and friend eat delicious meal. In fact, once dehydrated, it can be eaten like jerky. It is easy to do and it is delicious. They are different meats which you can dehydrate. These can be beef, turkey, tune, or even shrimps. Through food dehydration, you can preserve meat without adding extra cost to your budget. Choose the type of meat that you want to dehydrate. Wash them thoroughly to ensure that they are all clean. Cut them into pieces. Add seasoning and spices like soy sauce, salt, pepper, and garlic in a bowl. It is just like you are marinating the meat. Spray the tray or rack with olive oil so that the meat won’t stick to it. You just need to monitor it. Rotate the tray of the dehydrator if it requires. But never forget to check it if it is completely dried. The jerky should turn into a dark color of brown. You can put the jerky in a plastic bag and place it in the refrigerator until you are ready to consume it. Make sure that your hands are well-cleaned before marinating the meat. If the meat you’ve chosen has lots of fats, remove them. As much as possible do not choose a meat with lots of fat as it may not be dehydrated. When storing your jerky, you can also use an airtight jar or container. In this way, you will preserve your jerky longer. Always remember that your jerky should not also be too dry because it will not become edible anymore. There’s no denying that jerky is one of the US’ favorite snacks, but there’s also no denying that it’s expensive, and many people see it as a big treat in their weekly grocery shop. This is the main reason that many people are turning to the food dehydrator – this simple appliance allows anyone to make their own jerky for a much lower price than ready-made and packaged options. If you would like to dehydrate meat yourself then you’ll first need a dehydrator appliance. Take a look at our By Brand pages and By Type pages for information on the best selling models and current ranges. From there, you can decide on what marinades or jerk seasonings to use, and of course which meats to use too. The most popular include turkey, beef, venison and buffalo. You should consider whether you want to marinade and season your meat before it is dehydrated, and if so then this should be done before the initial cooking to 160 degrees F. If you haven’t done so already, then slice your meat into pieces around half a centimeter thick, 6 cm long and 3 cm wide, and arrange them on your dehydrator tray. To dehydrate meat, all you need to do next is turn the dehydrator on, and if it has settings, set it to dry for a long period of time. Most jerky tastes best when it’s dried over at least 3 days. To ensure it is safe to eat, you should keep the temperature to at least 120 degrees fahrenheit for the duration. Once the meat dehydrating is finally dry, you can simply turn the appliance off and serve. It really is this simple to make your own beef jerky at home, and perhaps the best part is that you can choose your own seasonings too. – if preferred, honey, sugar or other sweeteners. Fruits finest suitable for leather contain apples, apricots, bananas, berries, cherries, grapes, oranges, pears, pineapples, plums, strawberries, tangerines, and tomatoes. Applesauce can be dried alone or additional to any fresh berry puree ahead of dehydrating. Applesauce will add sweetness and make the move up smoother and more pliable. Additional, spices can be additional to the pre-dehydrated berries combination which include cinnamon, cloves, coriander, ginger, mace, mint, nutmeg or pumpkin pie spice. Nonetheless, spices need to be applied sparingly. – Home made fruit leather or spin ups – one hundred% berries, a hundred% natural components that you handle. Shop decided to buy move up – Fresh fruit juice, corn syrups and trans excess fat. – Go with the real factor – residence produced leathers created with your food dehydrator. Heading out for a walk or a lengthy hike Is usually a thrilling factor to do. We adore the outdoors but soon after an hour or so we like to have munchies to chew on once in awhile. We virtually class these tidbits as a reward for possessing walked so far. What to require for the journey is a great question. A favorite of ours is path combine. Toss in dried apricot, bananas, apples, raisins and nuts. Yet another merchandise we take along is the excellent old granola bars. My preferred is chocolate covered. Beef jerky is yet another good snack. A great deal of fun can be had by dehydrating your very own goodies. A great dehydrator will expense you below a hundred dollars and they perform nicely. Dehydrating you food is quite simple. The dehydrator comes with shelves stacked up so that they stay separated in the machine. To prepare the food objects you slice them up in skinny, evenly thick slices. Lay out the slices on the trays, spot the trays in the device and then change it on. The coils will heat up and the fan will blow the warm warmth throughout the food slices pulling out the drinking water from the food. Right after a few hours you really should verify on the food and check a piece or two. The apricots will turn rubbery as well as the apples and these kinds of. When completely dry the bananas will be tough. What is taking spot in the dehydrator is the normal water in the food is being eliminated. That indicates mould and bacteria do not have the damp surroundings to dwell in. Virtually each and every food item we eat can be dehydrated. For those fruits that discolor when in the air this sort of as apples they ought to be dipped in a mixture of boiling drinking water and sugar on a one:one ratio. Let the syrup cool prior to dipping. Veggies ought to be steam blanched for a minute. This method aids to stop spoilage. If you appreciate beef jerky you will have exciting drying your personal. Slice it slender, dip it in your very own marinade and take pleasure in a mouth watering feast. Nearly each and every vegetable can be dries as well. Once you have offered dehydration a attempt and you have a nice assortment on hand, require a bag alongside on the next journey on your favourite trail and you will have the immense satisfaction of nibbling on your very own dehydrated snacks. Men for hundreds of years have conserved meat simply by drying as well as dehydrating that. Jerky has maintained many hill men as well as trail individuals over the years, since it lends an outstanding level of proteins for a substantial energy dinner. The small whitening strips of dried out meat have been easily maintained in a journey pack or perhaps saddle handbag, making ground beef jerky the fast foodstuff of days gone by. Today’s refrigeration and also freezing technologies have given beef preservation another level of ease. Hunters and also trail-hikers account for almost all of the beef jerky shoppers of this age. However, latest television shows showing you survival methods, along with a restored desire for eco friendly living on the list of general public, offers resulted in a growth in ground beef jerky preparation along with consumption. Because the economy is constantly on the sink, a growing number of consumers are deciding on homemade jerky within the commercial choice. Making gound beef jerky is not tough, but selected steps have to be followed cautiously in order to prevent the actual meat through spoiling. Just before attempting a new beef jerky menu at home, determine first which usually drying strategy you plan for the meats. Many fuel oven masters rely on the particular pilot lighting setting regarding dehydrating lean meats. The holders are already offered, and plenty of room is available pertaining to multiple containers of meats. An oven in addition allows for sufficient air flow across the racks, absolutely essential for contamination of meals. Commercial dehydrators will also be popular regarding beef jerky prep. Most types fit for the kitchen counter, trying out minimal room and maintaining great aesthetic worth among the some other kitchen appliances. Numerous racks loaded vertically records space for that slices involving beef to get arranged. When a drying technique has been proven, the next step throughout beef contamination is various meats selection and get. Always look regarding cuts regarding beef together with low seen fat content material. London broil is a superb cut regarding beef jerky, however the cost might dictate another option. If a fattier minimize must be decided on, the fat could be trimmed following your purchase. A few butcher outlets will portion meat on an added payment. Because the various meats must be sliced up very slim, this may be a useful option. Carry the various meats home along with wash that with water that is clean. Examine your beef pertaining to fat along with trim any kind of areas that won’t look low fat. Fat won’t dry combined with rest of the gound beef. This will cause rancid jerky that may lead to foods poisoning. Extra fat removal is critical. As the body fat is attached away, set out to slice the particular meat in to strips which might be no heavier than 1/20th inch. Thicker cuts will not dry out all the way through. Meats that maintains moisture will certainly rot, therefore take the correct steps how to ensure achievement. One the particular beef continues to be sliced, cook a marinade within a bowl or even pan sufficient to hold the actual meat cuts. Enough room must be remaining in the serving to allow your marinade to hide the various meats. Olive oil, white vinegar and marine salt are normal ingredients within meat spices, but many different commercial marinades can be found in the food store. Smoked the taste experience or hot enhancements could be added in accordance with taste. Put the gravy over the beef slices along with refrigerate regarding ten to be able to twenty-four hours. Extended marinade periods result in much more flavorful various meats, but the meats also amasses moisture within this process. Just about all moisture have to be removed through the drying period, so lengthier marinade instances will increase the drying out procedure. For additional flavor, the particular marinated meat rounds can be explained in dried up seasoning just before drying. Beef seasoning or even any dry out meat caress will add the spicy layer to the done beef jerky. It’s wise to use these types of dry seasoning sparingly through the first menu. If the outcome is too mundane, add more flavoring to up coming batches. Following your meat continues to be seasoned, it is time to arrange the actual slices about drying holders, trays as well as dehydrator pans. Non-stick preparing food spray is known to prevent the beef from adhering. This is particularly beneficial if the various meats marinade covered sugar or perhaps anything desperate. Set the actual oven temp at One hundred fifty degrees Fahrenheit, or perhaps turn on the actual dehydrator according to maker instructions. Drying out meat doesn’t take a lot of time. 3 to 4 hours can be average, nevertheless check the various meats regularly regarding dryness so that the jerky is done. Beef dried in racks doesn’t have to be flipped, but pieces arranged about trays or even pans must be rotated throughout drying. Keep the beef jerky inside sealed storage containers or plastic-type bags to help keep it refreshing. Usage inside two weeks is mandatory for entire flavor along with a fresh tastes. Most any meats can be dehydrated and made directly into jerky as long as your cut can be lean therefore experiment with poultry, rabbit, deer along with turkey to obtain the jerky that most closely fits your flavor as well as your finances. make beef jerky using a food dehydrator is actually quite easy. Just follow the steps and you will be making his own beef jerky in no time! First, it is necessary to select a good cut of beef. You want something lean here, so choose carefully. Make sure it’s a fresh cut, do not buy anything close to the expiration date. Dehydration rates reinforce the process of aging, while the dehydration, so you do not want anything close to being defeated. You will need your selected meat cut into very thin slices, about 1 / 20 of an inch is ideal. You can do it yourself or see if the butcher can do for you. Be sure to remove all fat from meat as you can, the fat makes the meat to spoil faster. Once you have the meat thinly sliced and removed all the fat layer over the meat with your favorite condiment. Does not really matter what kind, just pick what you know better than you! One thing to consider here is the amount of salt in their seasoning is in it. The salt helps to dehydrate the meat, so if your favorite station does not have much it would be prudent to add more to it. next layer, the food dehydrator trays with nonstick cooking spray. If you do not have serious problems getting the jerky! Leave space between each piece of beef jerky, if you are playing the air can not enter between them and the humidity is maintained. Set the food dehydrator at 150 degrees. If you have a timer, be sure to use it, I will not forget that! If this is your first series of jumps, be sure to check it every hour, I do not want too. It usually takes between two and six hours for thin slices of dried meat to dehydrate. Check frequently during the cooking process to see if done. To prove that taking a knife and cut through a piece. Inspect the center. Are there rough spots? Do you see the same color throughout the interior? Failure to replace the falls and continue dehydrating. The exact time needed will depend on how thick your slices of beef are, the amount of salt used, and food dehydrator. 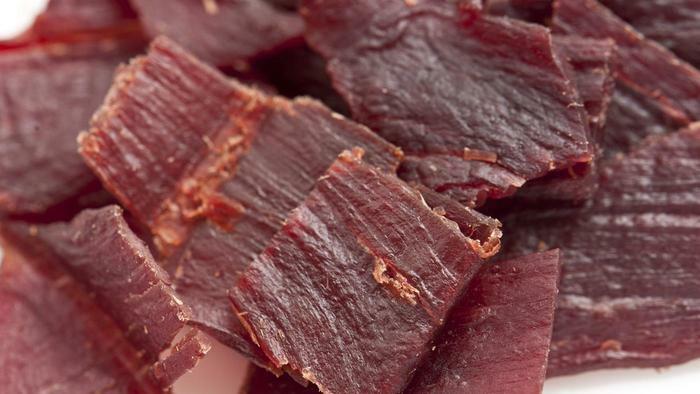 Making beef jerky at home with a dehydrator is easy. 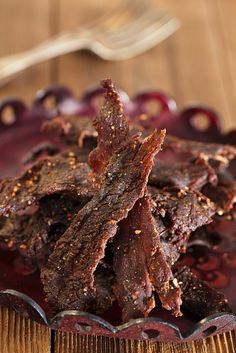 If you have the time, making your own beef jerky saves your money and makes a great healthy low fat high protein snack. A good dehydrator is essential in the jerky making process. 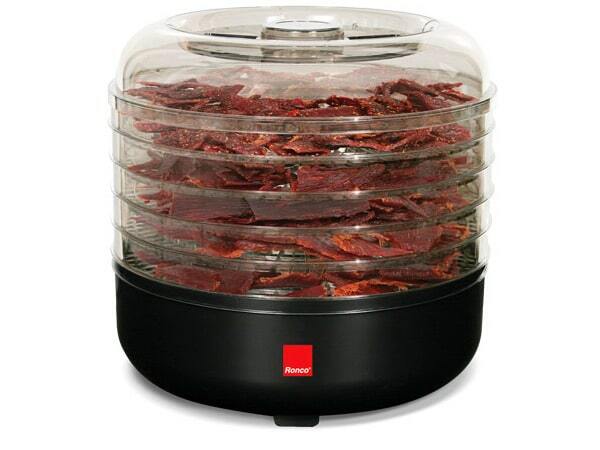 There are several models of beef jerky dehydrators. Here’s how to tell the good ones from the cheap ones. 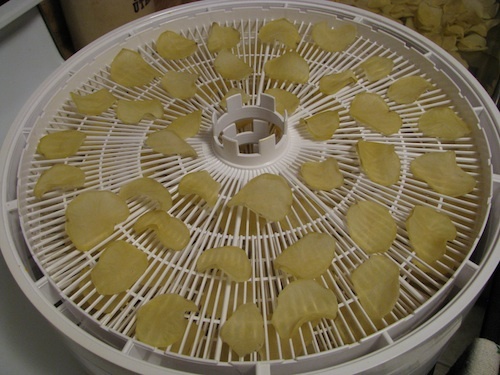 A dehydrator that distributes the air flow evenly will produce even and fast drying. If you see a unit with a fan at the bottom, it won’t have uniform drying. Look for a unit that can control the temperature. A good dehydrator will have a nice range of temperature such as 95 to 160 degrees. A versatile dehydrator is compact to fit on your kitchen counter with the option to expand the amount of trays. This allows you to customize the dehydrator to how much beef jerky you want to make. You would think a timer is a standard feature on a dehydrator, but not all models have them. This is a must feature so you don’t have to worry about keeping track of how long the dehydrator has been on. Make sure the dehydrator says the trays and accessories are dishwasher safe for easy cleaning. If not, the parts may warp if you wash them in the dishwasher. Place the strips of meat along with all of the remaining redients into a large, 1-gallon plastic zip-top bag and move around to evenly distribute all of the ingredients. Place the bag into the refrigerator for 3 to 6 hours. Follow your dehydrator instructions for drying times. Drying time may vary due to meat size. The jerky is finished when it is firm and dark. Do you want to know how a beef jerky dehydrator works? Drying meats has been done since man first laid a piece of meat down in the sun. This was probably just an accident; but when the hunter came back to get the piece of meat that he had laid down, he discovered that the heat from the sun had made the meat sort of hard, as some of the moisture had gone out of it. Later on, probably by trying this process over several times, man learned that unlike fresh meat that would spoil over time, the longer the meat had stayed in the sun and the dryer it became, the meat lasted longer. On down the time line man realized, he could dry the meat out during the hot days, and store it for use in the cold of the winter months when hunting was scarce. Over the past 100 years or so people have experimented with food drying, always searching for an easier way to do things, and in just the last 50 years food dehydrators were invented. Now you can dry out your own food to store for the hard winter months, or when money is hard to come by. A food dehydrator is a kitchen appliance that is used for drying meats and other foods. It uses very warm air to evaporate the water content that is stored inside of the meat. The reason for this dehydration process is that it is one way to preserve foods for long periods of storage. The air on the outside of the appliance is sucked into the bottom of the dehydrator and a small electric motor blows warm air from a heating coil, across the meat. As the air flows over the beef strips, the water that is stored inside the meat begins to slowly pull the water from the inside of the meat outwards, and the meat will begin to shrivel up as it dries out. There are approximately 20 different types of food dehydrators on the market today. They vary in shelf sizes, and outward appearance. The more shelves that a dehydrator has the more meat you can get in the appliance; however, it is also more costly. A 10 tray dehydrator looks like a medium sized box. That is made with plastic. It comes in a 600 watt unit, and its measurements are 21.1 x 15.2 x 15.1”. However, you can purchase a 700 watt unit that is not quite as large, it only has 5 shelves, but you can expand it to 12 trays, which are sold separately. These dehydrators have a fast even drying period and you will not have to rotate the trays unless you wish to do so. That is left up to each individual, some like the idea of rotating the trays for a certain periods of time, and others like the fact that you really do not have to rotate the trays at all. 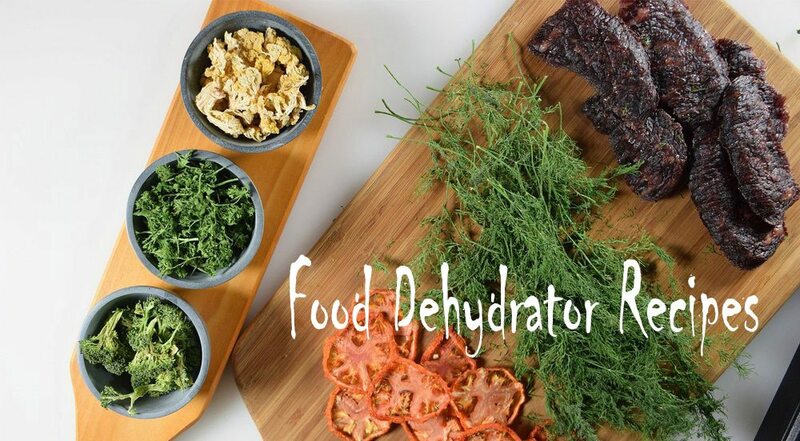 Using the beef jerky dehydrator allows you to make your own nutritious protein snacks. You can also learn to use other types of meats as well; such as, chicken, turkey, and venison. You will enjoy learning to prepare your own snacks. Then eat them fresh while you watch TV at night.